I use card stock. I will sometimes buy it at craft stores but, I really like 'Stampin'Up!' products because the ink matches the paper. This stencil is from Creative Memories. It is called 'StoryLines'. 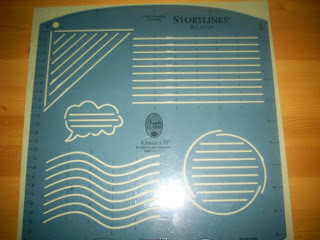 This is what I used to make the lines on the guest book pages. Sometimes, I use it to make lines on my scrapbook pages for journaling. These are 'Stampin'Up!' 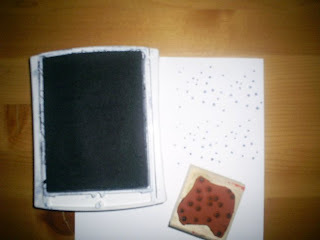 background stamps. These are great fillers for bare spots on cards or pages. This is the stamp I used on the card. Here it is shown in navy. Posted by Lisa at 5:14 p.m.
March 31, 2007 at 9:49 p.m. 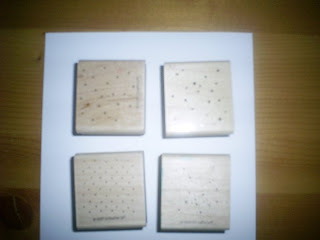 I love Stampin Up! I used to have a big ol huge list of stamp sets I wanted to get, I finally tossed it the other day though since I need to use what I do have more, lol :o) I will however be putting in an order for more embellishments soon! The children love using mine up when we have made cards! Neat post! Look forward to seeing how you make some of your cards!! AND to your sewing post! April 1, 2007 at 9:53 a.m.